Aging is accompanied by a general dysregulation in immune system function, commonly referred to as immunosenescence. This progressive deterioration affects both innate and adaptive immunity. Studies have suggested that aging is associated with increase permeability of mucosal barriers, decreased phagocytic activity of macrophages and dendritic cells (DCs), reduced natural killer (NK) cell cytotoxicity, and dysregulated production of soluble mediators such as cytokines and chemokines. These alterations could lead to increased pathogen invasion and poor activation of the adaptive immune response mediated by T and B lymphocytes. Aging, is also associated with quantitative and qualitative changes within the naive CD4+T-cell compartment. Decreased numbers of recent thymic emigrants (RTE), shortened telomeres, hyporesponsiveness to stimulation, decreased proliferative capacity, reduced IL-2 production, alterations in signal transduction and changes in cell surface phenotype have all been reported. These changes likely contribute to the poor response to vaccines and increased susceptibility to infectious diseases and neoplasms reported for older adults. 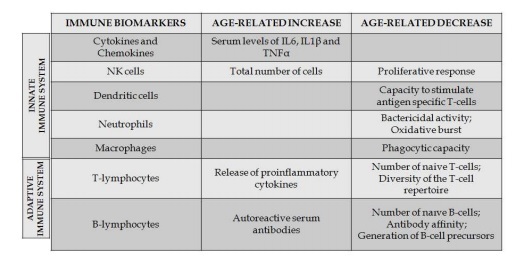 Aging causes a shift in the ratio of naive to memory T-cells, with associated changes in the cytokine profile that favor increases in pro-inflammatory interleukin-1 (IL-1), interleukin-6 (IL-6), interferon (IFN), tumor necrosis factor (TNFa), and transforming growth factor (TGFb). The production of IL-6, but not IL-1 or TNFa, by peripheral blood mononuclear cells increases in the elderly. As the hematopoietic system ages, the immune function deteriorates, the lymphoid potential diminishes, and the incidence of myeloid leukemia increases. Aging leads to increased stem cell dysfunction, and as a result leukemia can develop in failed attempts by the bone marrow to return to a homeostatic condition after stress or injury. Stem cells leave the hibernation state and undergo self-renewal and expansion to prevent premature hematopoietic stem cell (HSC) exhaustion under conditions of hematopoietic stress. The remaining stem cells divided more rapidly as if to compensate for those that were lost. Stimulating old stem cells to grow more rapidly, perhaps by stress such as infrared (IR), puts stem cells at greater risk of becoming cancer cells because of acquired DNA damage. Eat less or take one pill? Do you want to measure you biological age? Dead people's bodies are usefull! What are the biomarkers of aging? Go to the dark side of... oxytocin!